Shortly after my first motion paper came out, Joshua Carp wrote a commentary making an uncontroversial point: that frequency filtering will blur undesired signal temporally. So if you have punctate artifact, frequency filtering can spread that artifact into adjacent timepoints. His Comment suggested that outlying timepoints be interpolated prior to frequency filtering, as opposed to frequency filtering then attempting nuisance regression or censoring. This is a fine point and it's one I've since incorporated into processing streams. Now, under my preferred processing stream, I perform nuisance regression first without fitting "bad" timepoints, then replace the "bad" data by interpolation, then frequency filter the data, after which I continue to ignore the "bad" timepoints. In this paper I hadn't yet added the interpolation step, but I showed how the composition of the global signal (in terms of beta maps) became much more similar between children and adults when "bad" volumes weren't fitted in the nuisance regression. I'm going to flesh this point out a bit here. I did quite a bit of work on motion between my first and second papers on the topic, and much of the work was never published. Some of it may be helpful to others as they develop or refine their processing streams. The images below show the t-test differences in beta maps for nuisance regressors, between the children and adult cohorts of the 2012 Neuroimage paper (Cohorts 1 and 3). The top row shows beta map differences when all time points are fit by the nuisance regression, the bottom row shows when the fits are only performed on "good" timepoints, which here are defined as FD < 0.2 mm. The data in the upper left panel (for the whole brain signal) are what was shown in the present paper. The second set of images shows histograms of these p values, and you can see that they substantially flatten when outlying timepoints are excluded from the regression (a null distribution of p values is perfectly flat). These data indicate that omitting outlying timepoints from the nuisance regressions yield more similar regression fits in datasets that differ by motion. For most of these regressors there's nothing more to say about this, but for the whole brain regressor these findings have implications of interest. One way that people map out the "distribution" of the global signal is by correlating the global signal with the signal at every voxel. Very similar distributions are of course yielded by beta maps. In the above data there are marked differences in global signal composition between the children and adults when you consider the signal over all timepoints, "good" and "bad". But if you exclude the "bad" timepoints, the global signal composition becomes much more similar in these populations. I tried to make this point in the Commentary but I think I didn't make it well based on conversations I've had. One other point that would have been nice to flesh out if we had had the space (we didn't) is how the properties of a frequency filter influence the temporal spread of artifact. I should first say I'm not a signal processing expert, I've never had formal training and everything I "know" I've picked up on the job. In other words I'm at the edge of my understanding in this paragraph and will gladly accept correction by more knowledgable people. But in general there is a relationship, for data of a fixed length, between isolation of frequency content in the pass-band and propagation of stop-band artifact (impulses) in the temporal domain. The next figure illustrates this using some simple filters. You can get the main point on the first row of images: when an impulse (or square wave) is added to another timeseries, different filters propagate the impulse different lengths. And these filters have different abilities to isolate the frequency content of interest (here, frequencies below 0.08 Hz). Perfect frequency control would correspond to the vertical dotted line in (B). The windowed-sinc filter comes closest to the desired frequency control, but propagates artifact (the impulses) further in time. The type of propagation seen in the Carp paper is most similar to the sinc filter, and actually seems to propagate further. Other filters with poorer frequency control propagate the artifact less in time. In the Petersen lab we used a Butterworth filter, bi-directional, of order 1 (higher orders perform more like the sinc filter). 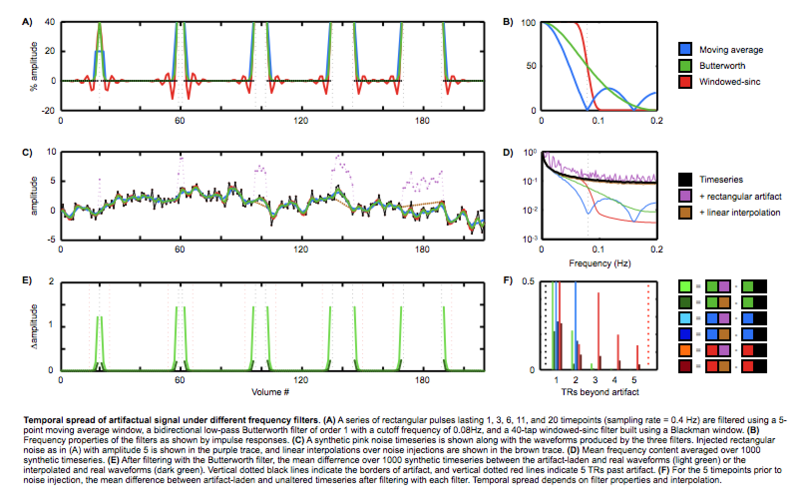 Since this paper, the phenomenon of temporally spreading artifact via frequency filters has been more fully explored. 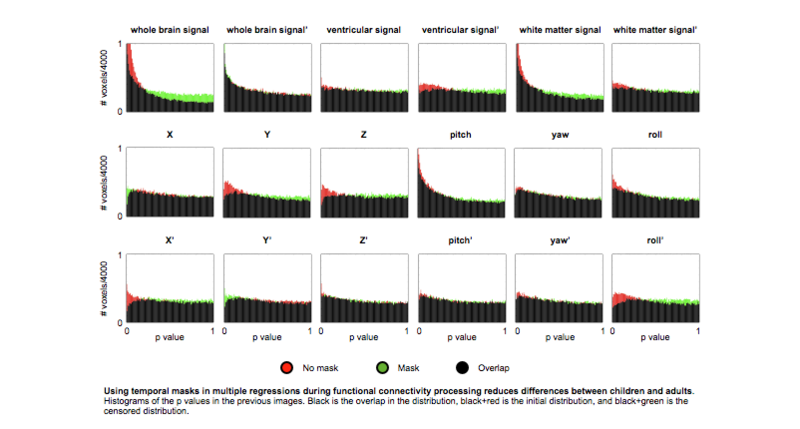 In my own data, shown in the 2014 Neuroimage paper, I don't see evidence that the frequency filter spreads motion artifact to volumes prior to the motion, at least in terms of changes in correlations when those preceding volumes are censored. But of course this behavior is contingent on the particular frequency filter being used, and the magnitude of the artifactual signal. This exchange of commentaries helpfully clarified some issues in processing, and I think everyone agrees that replacing outlying data by interpolation is a useful procedure from an artifact control perspective. I discuss interpolation at some length in my 2015 Neuroimage review on motion artifact.